Numerous New Hampshire farms have their own education programs. One New Hampshire farm won a national award for most outstanding Children's farm tour program. 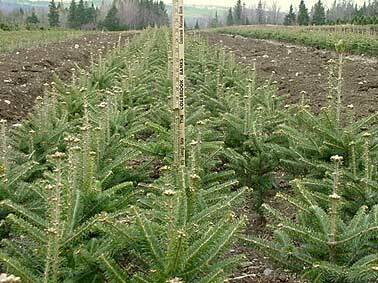 The Forevergreen Program developed at the Rocks Christmas Tree Farm is shown below. When a school starts the Forevergreen Program for the first time, the kindergarten students of that year can plant their own trees and watch them grow year by year up to the sixth grade. How do the students who did not get the chance to start the curriculum in kindergarten get into the program? All students can become part of the program by adopting trees of the right age for them to be able to harvest when they are in sixth grade. Choose twice as many trees for the students to adopt as you intend to donate to the school (we plant 24 trees knowing that 12 will be donated to the school). This will make sure that you will have enough trees to give to them even if some die. Construct and erect signs which say that the trees have been adopted and when they are going to be cut. Explain to the students that this will help them find their trees each year and it will prevent farm staff from cutting or managing them by mistake. If possible set the area for planting and adopting trees where the students can visit them at any time, even when you are not there. we get students, particularly younger ones, who bring their whole family to see their trees.